Begin by parting the hair off to one side.. 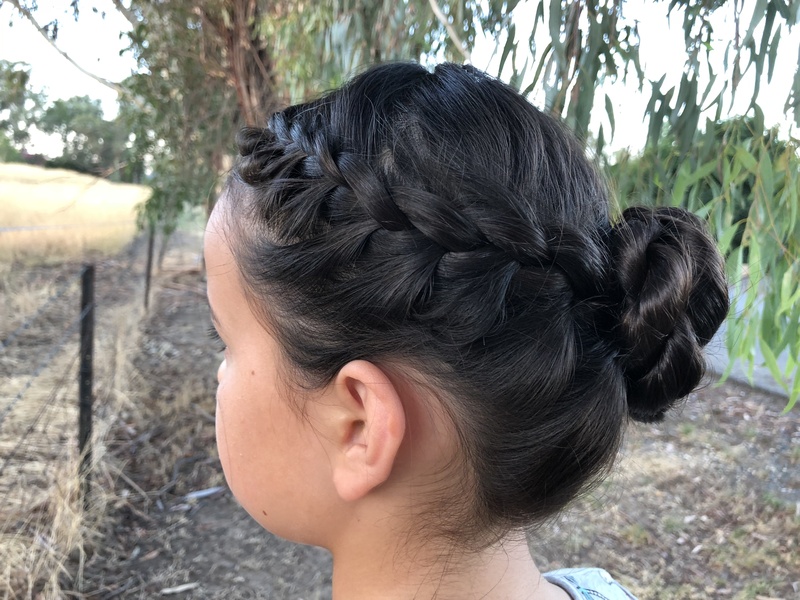 Pick up a section of hair on the heavier side of the part and separate into three sections..
Lace braid the hair until you reach the back of the head…(right strand over the middle, then the left strand over the middle, and so on; you only pick up hair from the side next to the face). Tie the hair into a ponytail. Once you reach the end, wrap the twist around the base of the ponytail. You can tie the end off, or just tuck in underneath the bun and pin it. Bobby pin securely and pancake as desired. Here’s the final look: a hairstyle that sounds girly, but is beautifully elegant! A big thank you to my sister for modelling for these photos with her lovely hair. And to finish off, here are a couple more snapshots of an Australian summer evening! Wow that’s really pretty! Thanks for doing my suggestion! Thank you! That photo was just fortunate chance – I didn’t notice the ‘split world’ kind of look until going over the photos later!